Apple iPhone 4 may have reception/antenna & yellow spot issue but that doesn’t stop users from buying iPhone 4, flagship next generation phone from Apple. As compared to iPhone 3G & 3GS getting factory unlocked iPhone 4 isn’t difficult since many countries like UK, France, Italy already getting factory unlocked iPhone 4 officially. However in US you may end up buying locked iPhone 4 with AT&T contract which is quite cheaper compared to factory unlocked iPhone 4 and there will be many users hoping for unlocking iPhone 4 with tools released by iPhone hacker community. Recently released iOS 4.0 has been already jailbreaked and unlocked and we have covered extensive guides to Jailbreak iOS 4.0 on iPhone 3GS, iPhone 3G & iPod touch 2G also now you can unlock iPhone 3GS 4.0 & iOS 4.0 on iPhone 3G baseband 05.13.04 with ultrasn0w 0.93. Even though iPhone 4 is running iOS 4.0 but the baseband is different from what iPhone 3G/3GS gets when you update to iOS 4.0 and with the news of iOS 4.0.1 on its way to fix iPhone 4 reception issue, situation looks quite complicated for unlockers as Apple may fix existing holes used to jailbreak & unlock iOS 4.0. 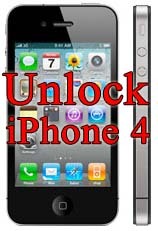 Also before you can successfully unlock iPhone 4 it must be jailbroken hence the process of unlocking iPhone 4 will be slower and will take more time then you can expect. If you have got iPhone 4 then we suggest you to wait for iPhone dev team message before updating to iOS 4.0.1. We will update you as soon as any jailbreak or unlock tools are released for iPhone 4. Follow us on Twitter or subscribe to RSS feeds to stay updated with iPhone 4 Unlock & Jailbreak.